RETAIL REVIEW 68 • SHOPPING CENTER BUSINESS • May 2017 to a total of 18 locations throughout the southeast. Southern culture is ushered into Revela- tor shops in a number of ways, beginning with design. "The design and aesthetic of each location is meant to be open, airy and relatively neutral with pops of local flavor and culture," says Singer. "We own all of the stores, but our store managers are empowered to bring in local flair that they're passionate about. We bring in local artists to each of our locations, and we also allow store managers to give local artisans retail space on our shelves. In Chattanooga, for example, we've given retail space to a local ceramic painter who creates really beautiful mugs and other ce- ramic pieces." The company also places an emphasis on local ingredients. "We use a tremen- dous amount of local vendors, including local dairy when possible, so the food and beverage experience and the coffee expe- rience is very much tied to location," says Singer. "You're not going to have the same pastries at every store across the South- east. We use local bread makers, and we work hard on the food and beverage side to make sure it's tied to the communities that we're in." Even a glance at Revelator's online menus showcases the company's reliance on local merchants and vendors. In the Charleston shop, for instance, espresso and milk beverages use local milk pro- vided by Lowcountry Creamery, located about an hour outside Charleston; bagel sandwiches are served on bagels from Charleston Bagel with meats from Artisan Meat Share, a charcuterie shop located less than half a mile down the street; Kom- bucha is sold from One Love Kombucha, a shop located 11 miles outside the city; and pastries are provided by local restau- rant, Butcher & Bee. "At Revelator, one of our main goals is to be very aware of where we are and the community we're in," says Singer. 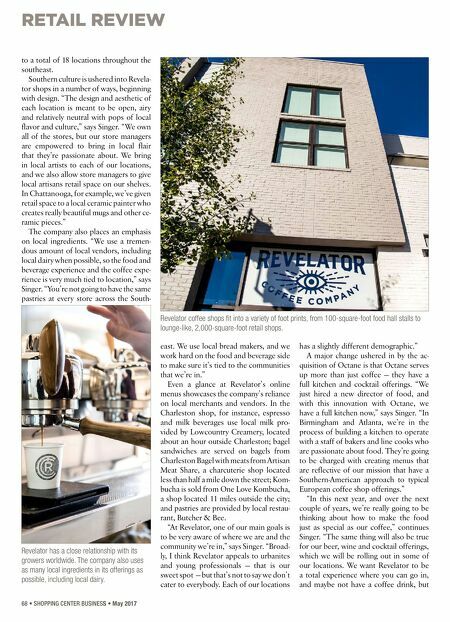 "Broad- ly, I think Revelator appeals to urbanites and young professionals — that is our sweet spot — but that's not to say we don't cater to everybody. Each of our locations has a slightly different demographic." A major change ushered in by the ac- quisition of Octane is that Octane serves up more than just coffee — they have a full kitchen and cocktail offerings. "We just hired a new director of food, and with this innovation with Octane, we have a full kitchen now," says Singer. 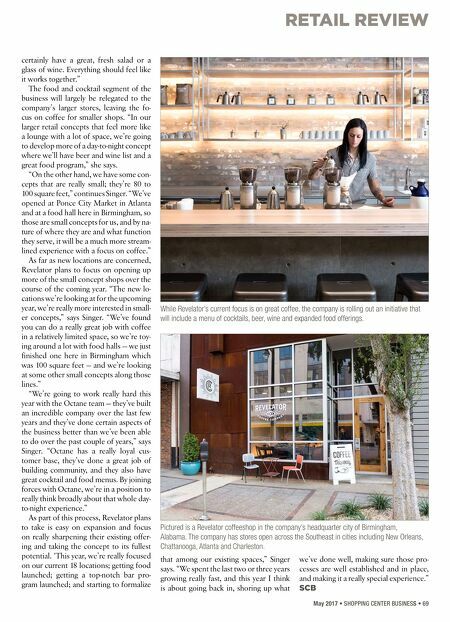 "In Birmingham and Atlanta, we're in the process of building a kitchen to operate with a staff of bakers and line cooks who are passionate about food. They're going to be charged with creating menus that are reflective of our mission that have a Southern-American approach to typical European coffee shop offerings." "In this next year, and over the next couple of years, we're really going to be thinking about how to make the food just as special as our coffee," continues Singer. "The same thing will also be true for our beer, wine and cocktail offerings, which we will be rolling out in some of our locations. We want Revelator to be a total experience where you can go in, and maybe not have a coffee drink, but Revelator coffee shops fit into a variety of foot prints, from 100-square-foot food hall stalls to lounge-like, 2,000-square-foot retail shops. Revelator has a close relationship with its growers worldwide. The company also uses as many local ingredients in its offerings as possible, including local dairy.